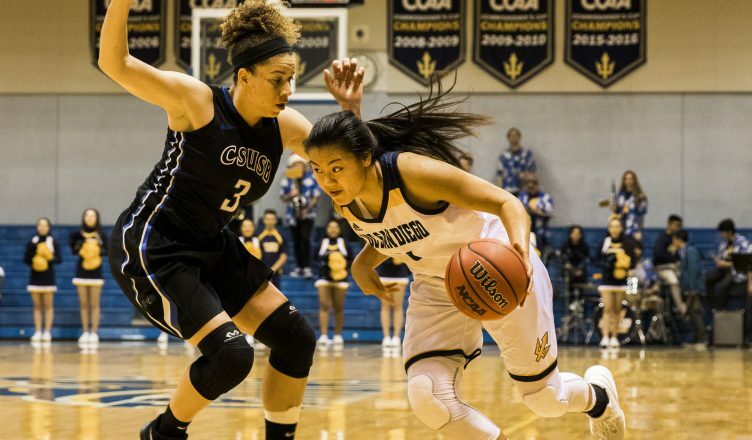 On Thursday evening, the UC San Diego women’s basketball team opened up its California Collegiate Athletic Association season at RIMAC Arena against Cal State San Bernardino, coming away with a 65–43 win. It was the perfect start to the conference season, as the Tritons had come off a loss the previous weekend. Hopefully, the win will give the team confidence and momentum going forward. The matchup quickly became one-sided in favor of UCSD as it dominated in all facets of the game. The Tritons were led by sophomore forward Mikayla Williams with her third double-double of the season, tallying 16 points and 11 rebounds. Junior guard Joleen Yang added 13 points on four-of-five shooting, including three-of-four from three-point land. UCSD ended the night shooting 38.2 percent from the field and a solid 42.9 percent shooting from three-point land. Defensively, the Tritons did a terrific job, holding the Coyotes to under 50 points off of 35.2 percent shooting. Cal State San Bernardino could not get anything to fall from beyond the arc, only managing to make one shot out of 10 from the three-point line. After the game, UCSD head coach Heidi VanDerveer told the Athletics Department, “I thought we came out and really established our defensive identity.” That defensive identity was definitely felt by the Coyotes throughout the night, as they struggled to get anything going offensively. The Tritons had a 16–10 lead that more than doubled by the half to 32–18. The dominance continued in the third quarter as UCSD only allowed Cal State San Bernardino to score six points, increasing UCSD’s lead to 29. In the fourth quarter, the lead increased to 32 points as the Tritons cruised to their first conference win of the season.